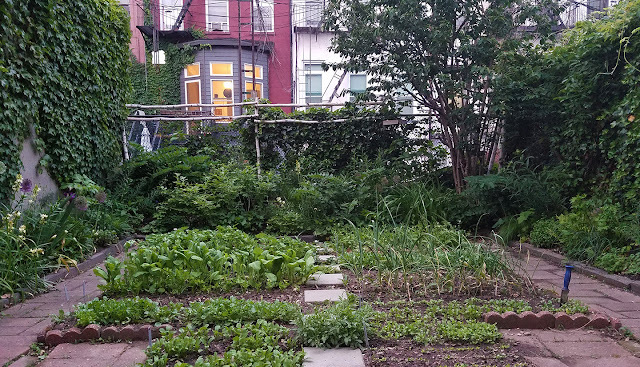 Before the heavy rains of last night I snapped a picture from the rear of the long back garden here at Chez 66 in Carroll Gardens. After snipping the tops of these fava beans (to eat raw in salads), I pulled them out. I love them - they have been a staple of my New York gardening life, perhaps especially as they are the first up in spring and the last down in winter, but I did not feel like doing daily battle with black aphids and a squirt bottle of soap (though it has worked on my Camassia flowers, also besieged). I chopped the bean plants up, dug unaffected parts back into the soil, and used the lower stalks (also no aphids) as a leafy mulch in one very difficult and sloped corner that stays very dry (under the viburnum). It is planted with some volunteer purple perilla and sunchokes. The umbrella from Patio Living has been even more useful than I had anticipated. In these months the sun actually clears the building well enough to make the area where the table is very hot in the morning, so if I have coffee out there, I can hide from it (the sun, not the coffee). And the Frenchman likes to keep it open for dinner because it creates a room beneath, a screen that gives us some sense of privacy. This photo has made me decide: Those paths have got to go. I really dislike the color and texure of those pavers, especially in photographs. I have a nice little Rewards Card from my credit card company (points mostly due to long distance air tickets) and I'm going to blow it on river gravel, which will camouflage them. It amazes me how quickly you turn a place around. It looks beautiful now. Thanks, Nancy - it still has issues, but it does look a lot better. It is a pleasure watching you do your magic in the garden. I just bought a tub of lady bugs, hoping this will help keep those little black things off my grapes and my daisies. Let them loose last week, they seemed to have flown away to somewhere. 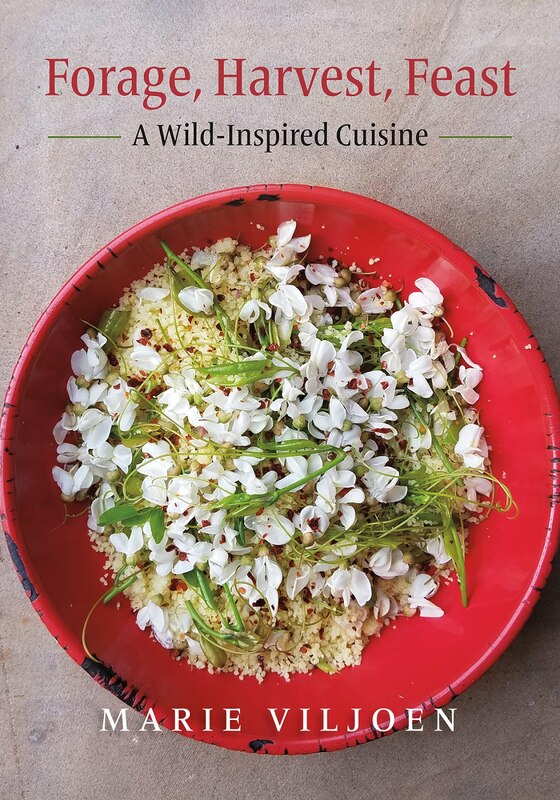 I did that for my Camassia spikes, but there are - were - sooooo many fava beans and I'd have to hold each one up in one hand. Too time consuming. looking so good - apparently the aphids think so, too - and healthy. love the POV of the first photo. Yes. Ground level apparently means aphids! I don't think it would be a good idea to spread river gravel on the top of your pavers. Every time you walk on it the pavers would be exposed unless you had a good depth of gravel. Take the pavers up, lay landscape cloth and then gravel. You could also paint the pavers with a colour to suit your discerning eye. 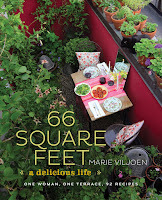 My original 66 Square Feet had pea gravel laid over landscaping fabric and an ugly, pressure-treated wood deck. It worked very well, and looked great (though the cat hated walking on it!). I'd lay it an 1.5inches thick, also on filter fabric. Painting very dirty pavers is not really an option - the scrubbing of each, pre paint, would be painstaking, and I'd rather not do anything permanent, since we rent. maybe if you used oyster shell tabby instead of gravel for the walkways you'd never have to add crushed eggshells to the dirt again. I had to look up tabby :-) I only knew the cat! An espaliered apricot sounds dreamy! I love watching you work your magic in the garden! Thank you, Nic. May your broad beans live long and prosper. You can make brick path, would look great! There so many beautiful ways to lay bricks. 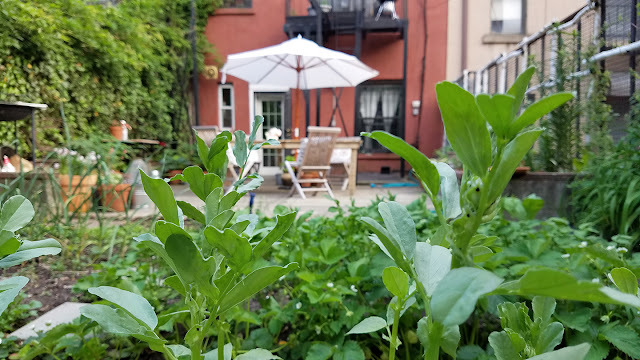 Your garden is already looking lovely. Great that you have a place for all your greens in the ground. Another negative to the river gravel is that it always ends up in your soil, unless you have raised, framed beds. Just a thought. We decided to go with grass paths, but we have to mow and no matter how you try, the grass always ends up in the beds. Of course, we live in the country and have a larger area to work with. There is no good option for paths that does not require a considerable amount of upkeep, IMHO. These beds are slightly raised, so I think it will be OK :-) Your grass paths sound wonderful.